Register now to receive alerts about cancellations, schedule changes, and other cf COBRA events! Click the link above OR text cfCOBRA to 84483. 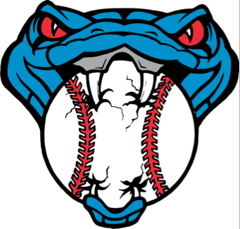 We also recommend adding 84483 to your contact using the name "Rained Out" Or "COBRA"
FORMAT: Any games when a team is playing their first game is a PLAY-IN game. The winner of that game continues in the King COBRA tournament. The loser moves into the Black Mamba tournament. If a team has a first round bye, they play the winner of a previous PLAY-IN game. Both teams in that competition will advance; one in King COBRA, the other in Black Mamba. Subsequent losses will result in elimination. AWARDS are given for both divisions, but may be different. All remain the same as Sunday Play, as shown in the rules (see link below). There is NO penalty for going over the pitch count. If a pitcher is revealed to have thrown over his limit, the manager should remove him immediately. The goal is to protect the arms of the young players, and we charge both teams with that responsibility. Failure to COMPLY may result in ejection, forfeit and/or expulsion. The visiting team is responsible for keeping the pitch count and is encouraged to share aggressively (announce without being asked) between each inning. Teams are responsible for monitoring pitch count announcements. Discrepancies should be declared and reviewed immediately. If there is still a discrepancy after discussion, the official pitch count remains. Click here to see all rules pertaining to COBRA.